How to disable services with the System Configuration tool "msconfig.exe" on Windows 8? 1. Enter "msconfig.exe" in the Start button search box. Then click "msconfig.exe" in the suggested match list. 2. 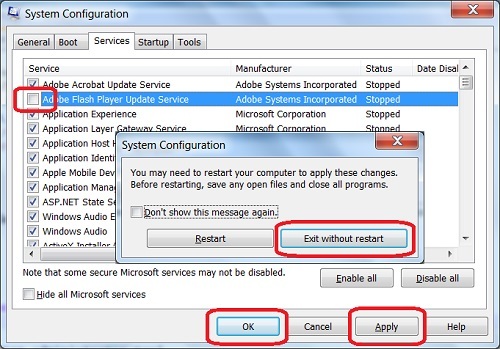 Click "Services tab" and select the service you want to disable, for example, "Adobe Flash Player Update Service". 3. Uncheck the checkbox next to "Adobe Flash Player Update Service". 4. Uncheck the checkbox next to other services you want to disable. 5. Click the "Apply" button. You may need to restart your computer to apply these changes. 7. Click "Exit without restart" button. You can restart the system later.